A regular base of 6–10 local residents continue to volunteer at each session throughout the year and from Spring to Autumn these have usually taken place twice a month. Participation at the Summer Festival, including running a Wildlife Quiz with prizes for children and snail races. Participation in the Gardens Winter Festival, including a bird identification competition for adults and children. Weeding and seeding of Wildflower Meadow in Wildlife Area. 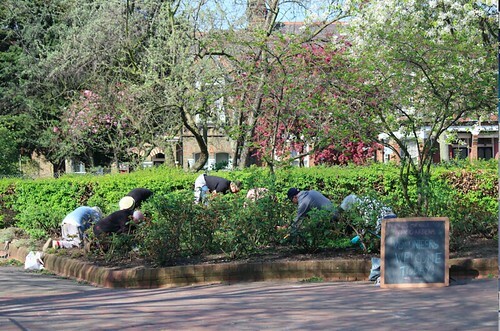 Clearance of elder bushes between the Education Area and Gardens on Enbrook Street and planting of new bushes to create a low-level hedge between the Education Area and Gardens on Enbrook Street. Planting of willow whips to try and re-form the willow dome which had been vandalised. Persistent weeding and removal of 10 or so dead roses and several trees from the triangular rose bed, plus procurement of 5 new rose bushes to replace dead ones. 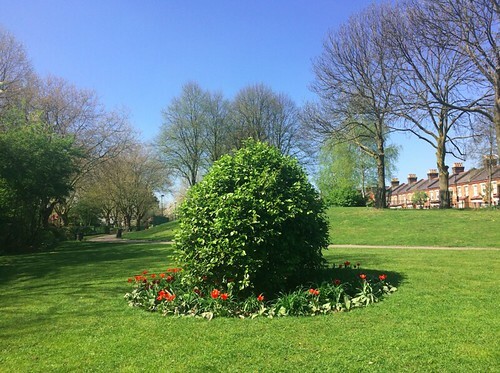 Acknowledgement also goes to the various donations from organisations which include plants from Hammersmith Community Gardens Association (HCGA) and wood-chip from various tree surgeons. Special thanks go to Charlotte and Ulla for ad-hoc and unpaid, invaluable horticultural advice. Two local pre-school groups and a primary school use the area on a weekly basis with excellent reports. During the summer holidays, the RSPB held six children’s workshops with activities such as bug hunting in the Wildlife Area. These were free and open for participation from everyone. Attendance was disappointing and it is believed this is due to late notice and the poor weather.. The RSPB have also tentatively committed to running a children’s workshop during the 2018 Summer Festival. FQPG continue their efforts to increase public participation and use of the area, the most successful events being our activities during the Summer Festival. Vandalism and antisocial behaviour continue to be an issue throughout QPG and litter continues to be a problem. FQPG continue to ensure sight lines are maintained within the Wildlife Area and encourages use of the area to discourage antisocial behaviour. Reports of the area being used as a pen for dogs and alleged fighting was reported to the police and local dog warden. As at the end February 2018, the Twitter account has 295 followers (up from 205 followers in January 2017) and an increase of activity on Facebook page including likes from 83 to 104 over the same time period. Have you followed or liked us?